You’ve heard it: writing powerful headlines is an essential skill for any writer. It’s a skill you need now more than ever. Readers have too much content to process, be it online or in print. They skim and then choose what pieces to read more thoroughly. How do they choose what to read? It’s the headline that pulls them in. Which means your headline needs to capture the reader’s attention. How can you check yourself to make sure your headline is doing a good job? The 4 U’s, developed by copywriting master and success coach Michael Masterson, has sometimes been called a writing formula. The 4 U’s indicate four elements that produce powerful content: Useful, Urgent, Unique, and Ultra-Specific. 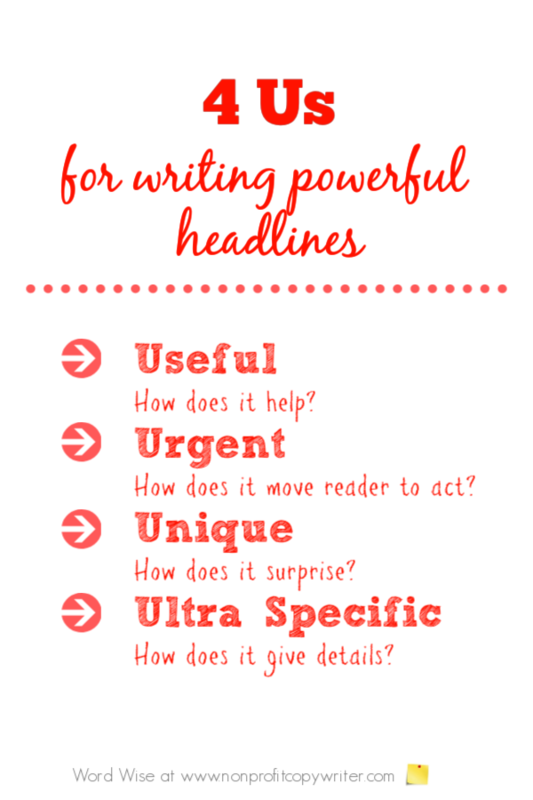 Use them as a checklist for writing powerful headlines, evaluating your headlines and improve them. 1. Useful: how does the headline help the reader? Write a useful headline by showing benefits. How will what follows help the reader, relieve a problem, answer a question, provide a solution? Show what’s in it for him. When your headline is useful to the reader, he wants to know more and he will keep reading. A useful headline focuses on helping the reader. 2. Urgent: how does the headline move the reader to act? An urgent headline moves the reader to act sooner than later. You can accomplish this by providing time frame or deadline in your headline, which can motivate the reader to act before it is too late. Your headline also can reference a particular stress, pressure, or acute need that the reader feels. By tapping into her desire for relief, your headline communicates urgency and moves her to act. 3. Unique: how does the headline surprise the reader? 4. Ultra-Specific: how does the headline give details to the reader? An ultra-specific headline is big on details. It can include numbers, indicate steps, identify an explicit or exclusive piece of information, or offer a specialized slant. You can call upon the 4 U’s checklist when writing headlines for articles and web pages. A headline that embodies all 4 U’s is a home run. But all 4 U’s do not have equal impact in headlines. If you can’t hit it out of the park with every headline, know which of the elements take precedence. That priority order differs between writing headlines and writing content. Target your writing and your self-editing accordingly. When it comes to writing powerful headlines, above all else a headline must give useful content to the reader in order for her to keep reading. Beyond that it must be urgent followed in importance by being unique, and finally ultra-specific. Use this checklist as a priority ranking as you rate your work. Useful: how does it help the reader? Urgent: how does it move the reader to act? Unique: how does it surprise the reader? Ultra-Specific: how does it give details to the reader? Check out How to Write Better Headlines, a quick, low-cost writing course by Nick Usborne. It's a super-fast (and super-affordable) way to build your headline-writing skills.